Do You Believe in Ghosts…? Do you believe in ghosts? You might if you find yourself at Mallows Bay in Charles County. Standing on its shores, a ghostly fleet of nearly 100 wooden World War I-era steamships appears to rise from the depths as the tide ebbs. These are friendly ghosts, as they saw no battles and lost no souls. Nevertheless, at nearly 300 feet long each the ships create an impressive sight, especially at times of extreme low water. Around a full moon, one could almost cross the water on the skeletons of these behemoths. These ships are remnants of the civilian U. S. Shipping Board Emergency Fleet Corporation, which was established when America entered WWI on April 2, 1917 to carry men, arms and equipment to the theater of war. They were also intended to carry supplies to European Allies whose shipping had been decimated by German U-boats. 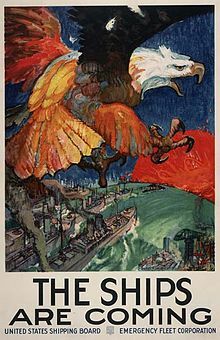 Donald Shomette, who literally wrote the book on this ghost fleet, put the project in perspective when he noted that, between 1899 and 1915, the U.S. had launched 540,000 tons of ocean-going shipping and now proposed to build 6,000,000 tons in 18 months. Unfortunately, by October 1918 –a month before the end of the war—only 134 of the 1000 expected vessels had been completed, 263 were less than half completed and none had crossed the Atlantic. Within a year of Germany’s surrender 264 were in operation, though only 195 had crossed the Atlantic once. With diesel engines and metal hulls now dominant, the ships were obsolete by the time they were completed and the U.S. Shipping Board determined to sell the fleet. A few – sold into private service and eventually abandoned in Curtis Bay – are still visible while traversing the Key Bridge. In September of 1922, a firm purchased 233 ships for $750,000 (approximately the cost to build a single ship) and moored the majority in the Potomac to be taken to Alexandria, VA and broken for scrap. After the vessels in the Potomac caught fire, broke loose in storms, and created other problems, the company corralled them in Mallows Bay. Small-scale salvage operations took over the bay during the Great Depression, providing 15% of the per capita income for Charles County residents at that time. With the outbreak of WWII, Bethlehem Steel attempted to renew salvaging the vessels and constructed a gated burning basin at the back of Mallows Bay. Ultimately, the company determined it was not cost effective and abandoned the effort. As the years wore on, the slumbering fleet became part of the maritime landscape, providing roosts and nesting sites for osprey and eagles, a nursery for bass that has made it a prime fishing ground, and shelter for many rare, threatened and endangered species. The bay and its denizens are best viewed from the water and the shelter provided by the vessels creates prime conditions for kayaks and canoes. Numerous State and local government agencies, environmental organizations and private citizens have long wanted greater recognition of Mallows Bay’s many merits but no single program existed that provided the right fit. Last year the National Oceanic and Atmospheric Administration (NOAA) announced it would consider community-driven nominations for new National Marine Sanctuaries; the first in more than 20 years. 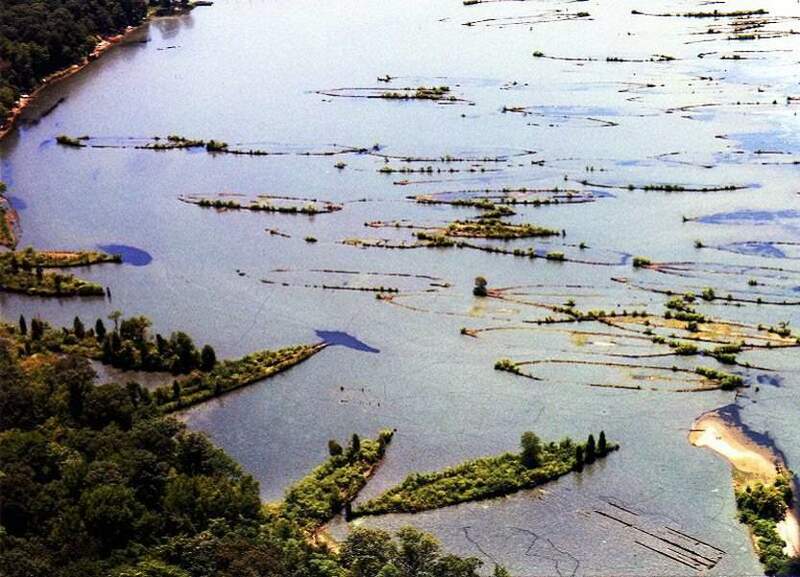 The steering committee, consisting of State and County agencies, environmental organizations, tribal representation, fishing organizations, education and outreach specialists, and citizens-at-large, developed a nomination for Mallows Bay and a portion of the Potomac River in 2014, to coincide with the initiation of global commemorative activities for WWI. The application was submitted by the Governor and included letters of support from nearly 100 groups. In January 2015, the Committee received word that the nomination was accepted into the NOAA Inventory for consideration as a viable candidate for the establishment of a National Marine Sanctuary. If the decision is positive, NOAA will solicit public comment and the steering committee will initiate public scoping meetings. 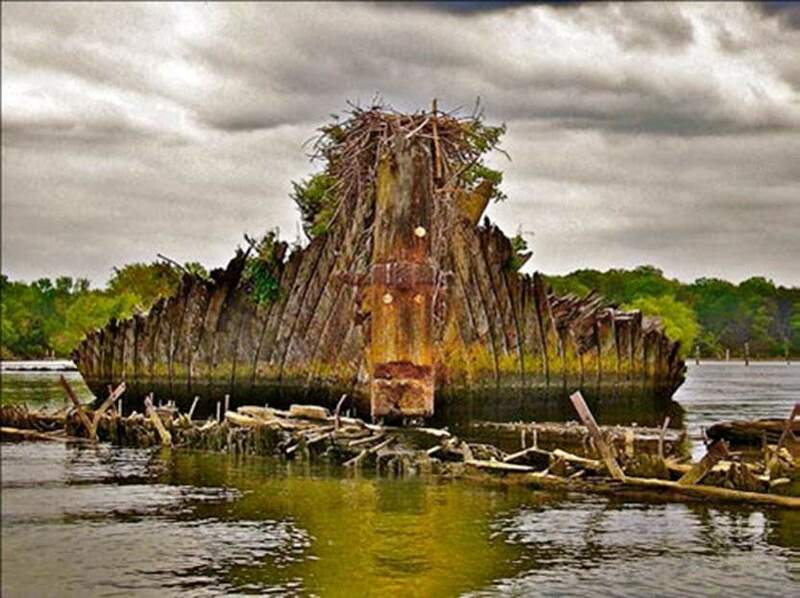 If all goes well, we might cut the ribbon on a National Marine Sanctuary close to the Nation’s capital in time to commemorate the 100th anniversary of America’s entry into World War I.
Ghost Fleet of Mallows Bay and Other Tales of the Lost Chesapeake. Donald G. Shomette. 1996. Tidewater Publishers: Centerville. Don is currently working on two new volumes about Mallows Bay so stay tuned for these too. Read the nomination and see the letters of support for this endeavor. Vandercastle and Harrison meet the Piscataway in 1699 (painting by William Woodward). In 1608, Captain John Smith mapped the Indian village of Moyaons near the confluence of the Potomac River with Piscataway Creek. Smith did not describe the people of this village in his journal, but twenty-five years later Governor Leonard Calvert met with this Indian nation—the Piscataway. When Calvert met the Piscataway, their village had moved from Moyaons to the head of Piscataway Creek. Over the years, their principal village would move to Zekiah Swamp (1680) and then to the foothills of Virginia (1697). In 1699, the Piscataway returned to the Maryland side of the Potomac, settling on what is now known as Heater’s Island. Thanks to colonial documents preserved in modern archives, we have a surprisingly good picture of the Piscataway Fort on Heater’s Island. In April of 1699, two emissaries of the Virginia governor—Giles Vandercastle and Burr Harrison—journeyed to the island where they observed a nearly completed fort (50-60 yards square) containing 18 cabins, with 9 cabins outside the fort. Based on the Natives they observed, Vandercastle and Harrison estimated there to be 80 to 90 bowmen, which would indicate a total population on the island of around 300 people. In December of 1704, the Maryland Council dispatched Col. James Smallwood and his men to the island seeking a nominee for the new “Emperor” so the Governor could approve that person as required by law. Smallwood found the fort nearly abandoned, and learned that a smallpox epidemic had recently taken the lives of 57 men, women, and children (presumably including Emperor Ocotomaquath). The Piscataway rebounded, however, and in 1712 the Swiss adventurer Baron Christoph von Graffenried encountered a vibrant population on the island, which he called “Canavest.” Shortly after von Graffenried’s visit, the Piscataway left Heater’s Island to settle in Pennsylvania and later in New York. Brass points, gunflints, glass beads, ceramics, and nails from Heater’s Island. Fast forward to the summer of 1970, when Heater’s Island – then privately owned, but now owned and managed by the Maryland Department of Natural Resources – served as the focus of the University of Maryland–College Park’s first archeological field school. 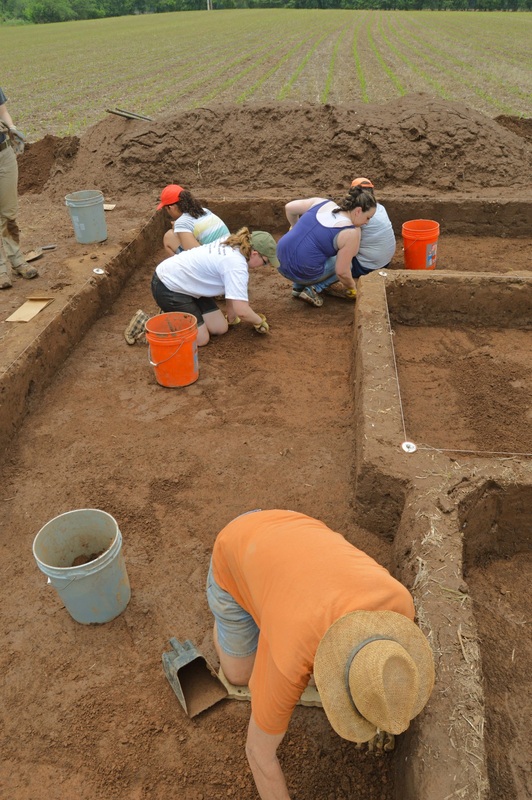 From late June through August, several dozen students, under the overall supervision of Dr. Robert Schuyler and the general field direction of Ivor Gross, excavated 113 5- by 5-foot squares at the site of the 17th-century Piscataway fort. Their excavations revealed a corner bastion of the fort structure (marked by a trapezoidal soil stain), a number of pit features containing evidence of what the Piscataway ate (mostly corn and deer), and an incredible collection of artifacts. Unfortunately, a report on the excavations was never prepared. In 2004, Dr. Schuyler (now at the University of Pennsylvania) transferred the collection and records to the Maryland Historical Trust and staff began analysis and report preparation. 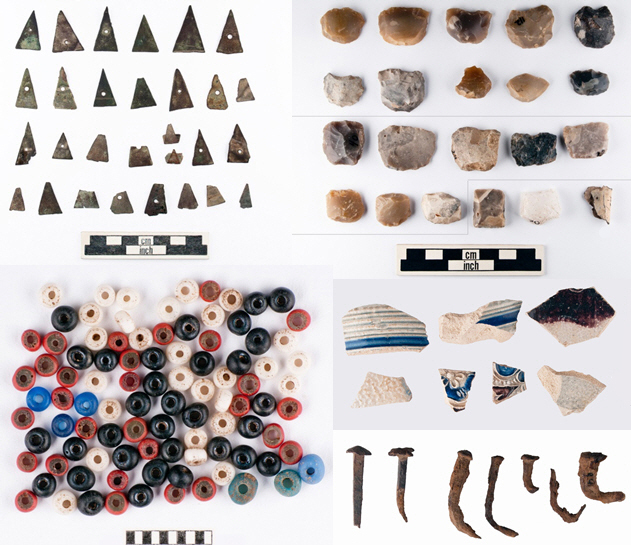 Readily apparent in the artifact collection is the material culture shift that occurred among the Piscataway: European goods (glass beads, iron nails, glass bottles, and more) had clearly replaced Native-made items. Stone arrowpoints are virtually absent, but triangular brass arrowpoints are plentiful. The Piscataway also adopted another European weapon—the firearm. The presence of guns on the site is marked by an abundance of gun parts, gunflints, and pieces of lead shot. Similarly, Indian ceramics and Native tobacco pipes were largely replaced by those of European manufacture. But this adoption of European goods seems to have resulted more from practicality than from assimilation. Metal knives were sharper and more durable than chipped-stone versions, and wine bottle glass could be flaked into scrapers more quickly than quartz. So while the Piscataway may have chosen more efficient European wares and materials, they did so while maintaining their Indian identity. This is evident in their self-governance and in their dealings with the colonists. The Piscataway strove to define their destiny. Modern Piscataway in traditional garb. When the Piscataway from Heater’s Island left Maryland around 1712, their documentary presence began to fade. In Pennsylvania, this group of Piscataway settled, and eventually merged, with Nanticoke groups. 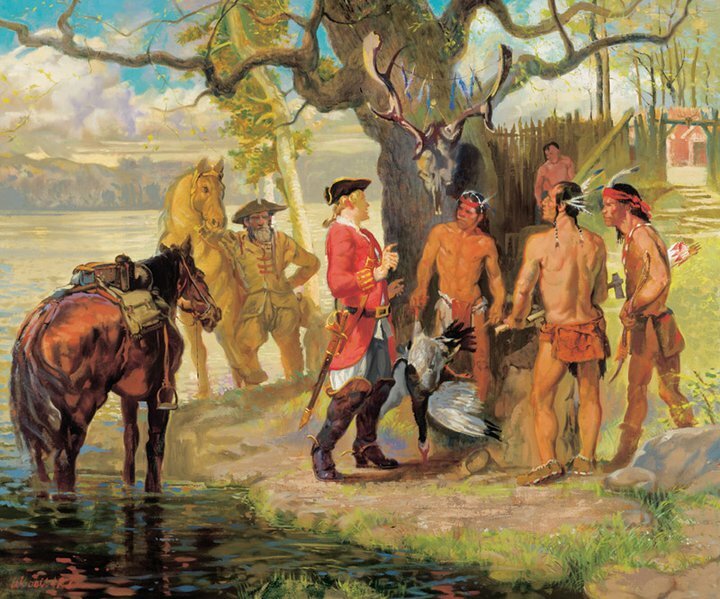 The Piscataway (or Conoy, as they were later known) appear as signatories on a handful of treaties as late as 1758. The last official mention of the Conoy tribe is on correspondence they signed in 1793. Yet this is not the entire story. When the main group left Heater’s Island for Pennsylvania, there were other Piscataway Indians still living in southern Maryland. These people may have been less visible, but they did exist. Documentary evidence appears in several court cases: in a 1707 case (not resolved until 1712), Queen Nannsonan and a group from Choptico sought restitution for a plundered Indian grave; and in 1736 “George Williams, an Indian” petitioned the legislature for title to the land he had long occupied in Prince George’s County. Certainly, many other Piscataway remained in southern Maryland but left no written record. In the 1920s and 1930s, chief Turkey Tayac began a Piscataway resurgence that reached a crescendo in the 1970s. Today, many in southern Maryland identify as Piscataway. 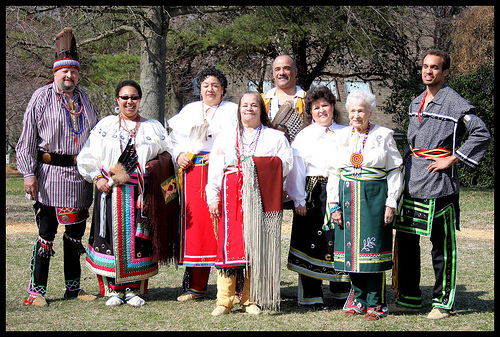 That Indian presence—300 years after the main group of Piscataway left Heater’s Island—led Governor Martin O’Malley in 2012 to grant state recognition to three Piscataway groups: the Piscataway-Conoy Confederacy, the Piscataway Indian Nation, and the Cedarville Band of Piscataway. You are cordially invited to join the archeology staff of the Maryland Historical Trust in the investigation of two overlapping Late Woodland Native American village sites along Glade Creek in Walkersville, Maryland. Mark your calendar now: the Field Session begins on Friday May 22nd and ends on Monday June 1st, including weekends and the Memorial Day holiday. You may choose to attend for half a day, a whole day, or any combination up to the entire 11 days. 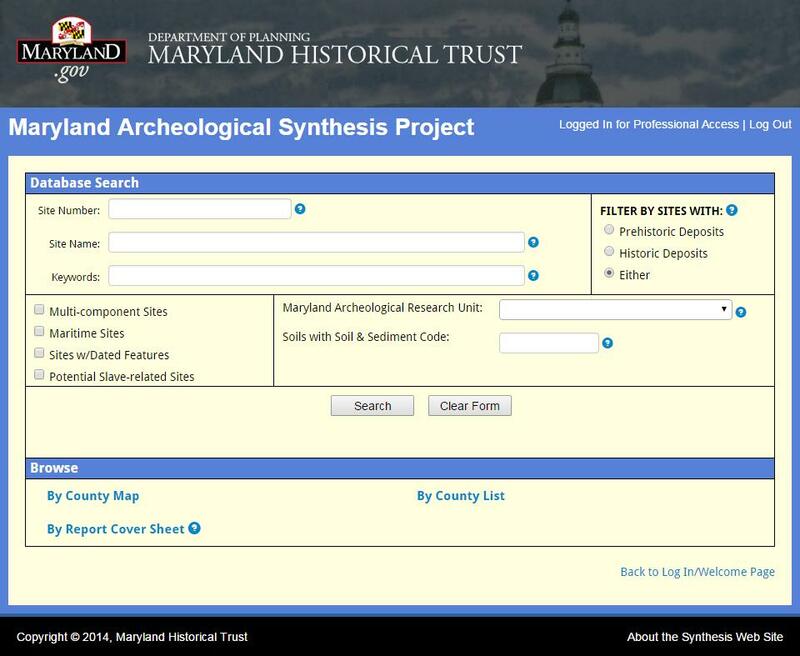 Pre-registration is available through the Archeological Society of Maryland (www.marylandarcheology.org, click on Field Session). We hope to see you there! On April 9, 1865, after four years of combat, the Civil War came to a symbolic end in the tiny hamlet of Appomattox, Virginia when Confederate General Robert E. Lee surrendered to Union General Ulysses S. Grant. 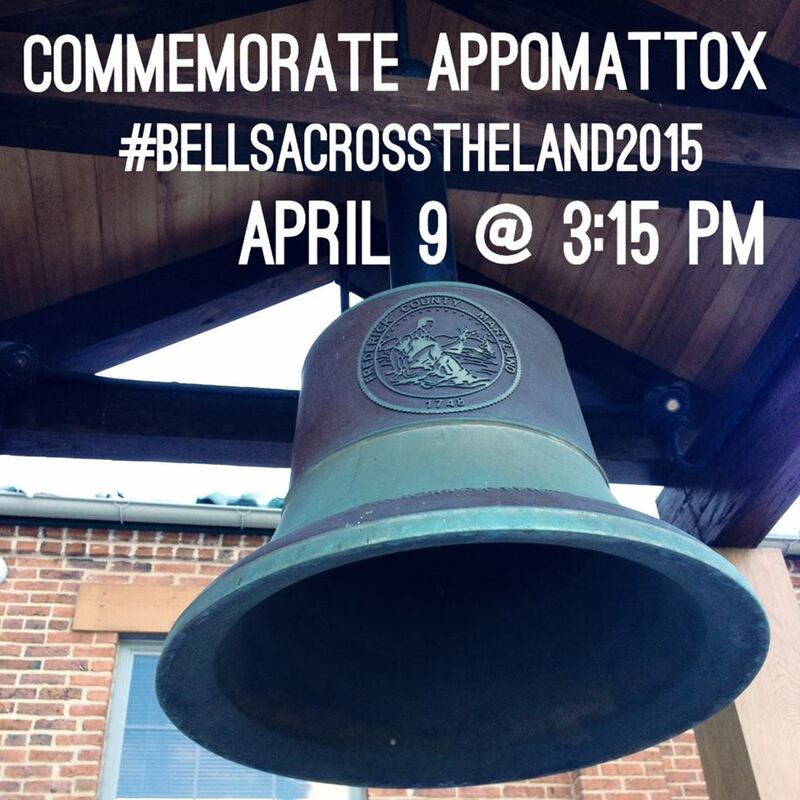 The surrender at Appomattox signaled the end of the long, harsh conflict which ultimately claimed the lives of 750,000 individuals and led to the emancipation of the nearly 4.5 million enslaved African-Americans held in the southern states, including Maryland.